Warm and unaffected, Philip Glass’s memoir is nothing like his music. Philip Glass has written a memoir. The composer Philip Glass has written a memoir. Philip Glass has written a memoir. It begins in Baltimore. The composer Philip Glass has written a memoir. It begins in Baltimore. The American composer Philip Glass, known for his use of repetition and incremental variation, has written a memoir. Philip Glass, the American composer known for his creative use of repetition and incremental variation, has written a memoir. It begins in Baltimore, where Glass was raised by a bookish mother and a father who ran a record store, and if the writing in the book mirrored his radically innovative, once controversial music, it might sound like the sentences you have just read. Fortunately, it does not. Words Without Music is an unblushingly old-fashioned account of the life of an artist who has done fascinating things in the company of talented and interesting people. Readers don’t have to like Glass’s music to find pleasure in this warm, unaffected, and deeply human book, but they may come away with an improved understanding of and a greater appreciation for both the music and its composer. It is only fitting that a book about Glass’s life can have the effect of transforming one’s view of his music. The proposition that aesthetic perceptions are unstable and subjectively informed is one of the core principles of his work. In the droning, rhythmic works that made his reputation in the 1970s and ’80s—the nonoperatic operas Einstein on the Beach, Satyagraha, and Aknaten, and the early work of his group, the Philip Glass Ensemble—and in his long, cyclical, meditative pieces, Glass produced waves of sounds with the express purpose of stimulating listeners to fill in the lacunae and make their own connections and associations, essentially collaborating with Glass to complete and personalize the music. As he points out in Words Without Music, all art works in this way, to some extent. 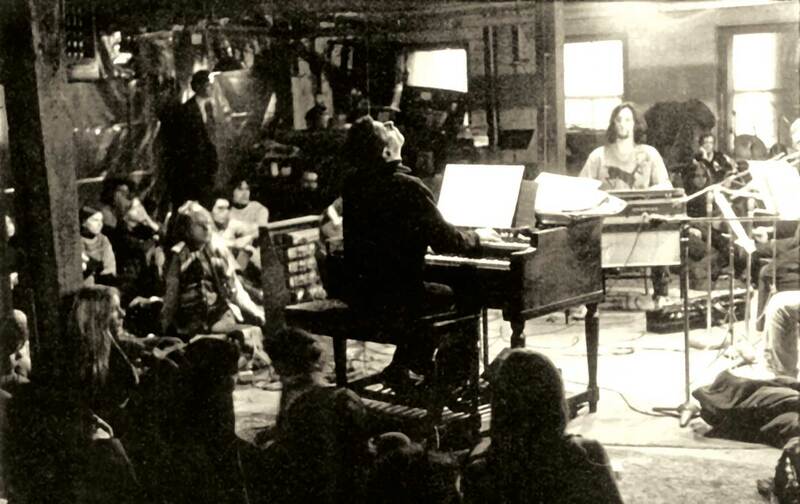 A book by one of Glass’s immediate predecessors in avant-garde music, John Cage’s theoretical rumination Silence (1961), was his philosophical inspiration. “The accepted idea when I was growing up was that the late Beethoven quartets or ‘The Art of the Fugue’ or any of the great masterpieces had a platonic identity—that they had an actual, independent existence,” Glass writes. What Cage was saying is that there is no such thing as an independent existence. The music exists between you—the listener—and the object that you’re listening to. The transaction of it coming into being happens through the effort you make in the presence of that work. The cognitive activity is the content of the work. This is foundational constructivist theory, as undergrad lit students know, and Words Without Music provides a handy opportunity to test it. If a listener’s view of a composer is one of the things that shapes his or her perception of the music, an autobiography that alters the composer’s image should have the potential to change the way the music comes across. Words Without Music has done precisely that for me. I have listened to a great deal of Glass’s music over the past several decades, and I’ve seen him perform with his ensemble at least six or seven times—in concerts and as part of the avant-garde Greenwich Village theater company Mabou Mines, which Glass co-founded 45 years ago. I’ve always admired him for his originality and determination to make music his own way. Before world music became voguish, Glass was drawing respectfully and judiciously from non-Western sources, echoing the recurring patterns that give Indian music its form, and he challenged long-entrenched conventions in opera and concert music by creating works that took shape slowly—very, very, very slowly—through accretion over time spans of some five hours. Undeterred by misunderstanding or ridicule, Glass kept working as he saw fit, amassing admirers and increasingly prominent collaborators to produce an enormous body of work: a dozen or so operas, 10 symphonies, scores to more than 20 films (including Martin Scorsese’s Kundun and Stephen Daldry’s The Hours), dozens of theater and dance works, and a couple albums full of arty pop tunes composed in collaboration with songwriters like Leonard Cohen, Suzanne Vega, Laurie Anderson, and David Byrne. For all my admiration of Glass as a pathfinder—an artist resolutely committed to an idiosyncratic vision—I have found some of his work a bit hard to take, and not always in the way that head-rattling challenges are ultimately good for the head. To me, his music has sometimes seemed cold, more impressive for its formal invention and daring, less so for being engaging or moving. I don’t fault the work for undue intellectualism, because Glass’s music doesn’t seem overly intellectual to me: It’s easy enough to grasp, and music has every right to stimulate the mind as well as the heart. Some of it just struck me as unemotional, even anti-emotional. I made the mistake of imagining that the composer of such music must be a pretentious ideologue. I lost sight of the fact that the art and the artist are not the same, and I was being too hard on the art to begin with. I still hold that some of Glass’s music is overly mechanical, to chilling effect. But that’s not really true of the bulk of his output—and, as is the case with my favorite composers (Igor Stravinsky, Dizzy Gillespie, Stephen Sondheim, Billy Strayhorn), the importance of his work as a whole certainly outweighs the shortcomings of an individual piece here and there. Reading Words Without Music would efficiently straighten out anyone who has shared my wrongheaded presumptions about Glass as a man and an artist. The author of this book is plain-spoken and self-effacing, smart and serious but unpretentious—a hard worker with a blue-collar attitude about the value of a job well done. Glass seems to have taken on the writing of his first book with the same unflinching willingness to tackle a new task that carried him through the sundry day jobs—loading trucks for a moving company, working as a plumber, driving a cab—that he performed for decades while he was composing and playing keyboards for little remuneration or recognition in New York. Glass was not able to make a living from his music until he was 41, in 1978. Glass writes unsentimentally but affectionately about his parents. His mother, Ida, was a schoolteacher who continued studying for her PhD while raising three children, and his father, Ben, was a resourceful small-business owner and self-taught music lover; they both instilled curiosity, a hardy work ethic, and a love of art and music in their youngest son. Ben Glass, puzzled by the failure of records by modern composers to sell in his store, “listened to them over and over again, trying to understand what was wrong,” his son writes, “but he ended up loving their music.” Young Philip would sneak downstairs from his bedroom and sit on the stairs, out of his father’s sight, listening and learning along with him. There is no discernible artifice and no (or barely any) pretense apparent in Words Without Music. Glass describes his work for a New York moving company, Yale Trucking, with the same matter-of-fact enthusiasm that he brings to his description of working with Beckett on Play or Robert Wilson on Einstein on the Beach. “It was a very good job,” he says about the moving gig, without any patronizing noble-savage airs or glamorization of physical labor. The process of loading the trucks properly, by first sorting the freight by weight and size, and then stacking from heaviest to lightest, back to front, interested Glass, much as he was drawn to the mechanical processes of composition. Glass trained himself to compose music productively by allocating three hours to it, 10 am to 1 pm, every day. He set a clock on top of his piano and then remained on the stool for the allocated period. “I tricked myself into composing,” he explains, by putting himself on a time clock, like a pieceworker in the steel mill where he was once employed. The moment is jarring. Did Aaron Copland really say “Nope”? Is Glass sure of that, 55 years later? I suppose he could be. Philip Glass is undoubtedly a gifted listener, and if his music has taught us anything, it’s that every tiny little bitty thing that occurs in a work has meaning. While reading Words Without Music, I returned to the music that is, after all, the reason for the words here. I listened from a new point of view, thinking of Glass now with an appreciation for his humility and unpretentiousness as a writer of prose. I reached for Glass Box, a 10-disc collection of his works released by Nonesuch in 2008, and played one at random; it happened to be the ninth CD, which opens with his Symphony No. 3 in four movements, performed by the Stuttgart Chamber Orchestra under Dennis Russell Davies. The piece struck me as lovely—simple and unassuming. But I’ve always liked it. I went through the box and played a disc with music I had never been so fond of: the Second String Quartet, a monochromatic work built with arpeggios laid atop a repeating rhythmic pattern—classic Glass. I still found it a bit chilly, but strangely now, I found myself less resistant to the chilliness and more compelled by the distinctive form of the piece. I paid more attention to the plumbing, and I didn’t think of it as quite so pretentious anymore. I asked myself: Am I being totally objective about this music, measuring it solely on its own terms, without allowing myself to be influenced by my conception of the composer? And I answered myself: Nope. David HajduDavid Hajdu is the music critic of The Nation and a professor at Columbia University.